Dickson-Murst Farm is home to The Conservation Foundation in Kendall County and serves as a program satellite office to the McDonald Farm main office. Staff, including the Kendall and Kane County Program Directors and Marketing Director, are located at the location. In Kendall County, The Conservation Foundation has recently been active in facilitating the Lower Fox River Conservation Planning Project and developing demonstration rain garden sites in Yorkville, Plano, Oswego and Minooka. Staff have also helped facilitate watershed protection plans for the Blackberry, Aux Sable, Big Rock and Little Rock Creeks. TCF’s Conservation@Home and new Conservation@Work programs are also active throughout the county. From 2000 to 2007, Kendall County was the fastest growing county in the United States. Our Fox River Education & Outreach Initiative seeks to help people become more aware of and enjoy the Fox River, which runs right through Kendall County, and ultimately lead to increased protection and care of the river. Click here to learn more about the Fox River Initiative! The Conservation Foundation was also instrumental in planning and facilitating the Protect Kendall Now! project which has been used by local agencies to guide the protection of thousands of acres in open space. 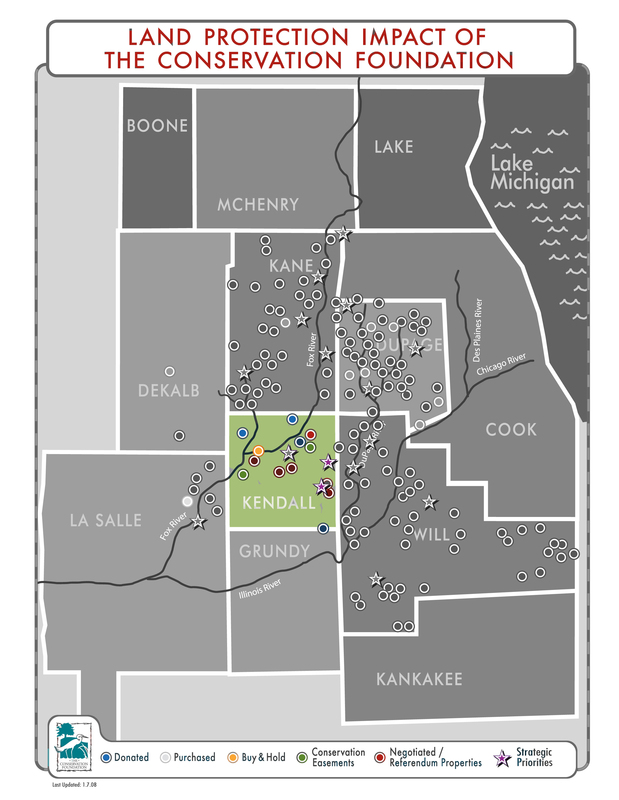 TCF has also worked with the Kendall County Forest Preserve to pass two successful public referendums to fund open space acquisition. The Dickson-Murst Farm hosts several public events each year including Days at the Farm and Bluegrass Festivals. The events are planned and conducted by the Dickson-Murst Farm Partners, a volunteer group of individuals from around the county that pitch in to maintain the facilities and conduct the events. For a detailed list of our accomplishments and activities in Kendall County, click here. To learn more about how you can help preserve and protect the Fox River in your community, click here. Our friends at the Kendall County Forest Preserve District and the citizens who have supported open space referenda in Kendall County have helped save some of its great places of nature. Click here to learn about Kendall County forest preserves and district programming. Kendall County is also home to one of Illinois' state parks. Learn more about Silver Springs State Park here.